I am intrigued that is "battery operated" yet "no batteries required"
Haha that's what I thought too when I read it! We have one of those and it just gives me peace of mind that they won't get up the stairs without me hearing them. It is a bit cheap and I'm not sure how long it will last but it is very loud. My biggest problem with it is forgetting the little remote control fob as I go downstairs in the morning. Last time I was out I also invested in a nice strong pole to put in the track of the sliding door. Someone here suggested it a while back and funnily enough a friend who used to be in the door and window trade suggested the same thing. Used one of these in garage & was loud.remote control takes watch batteries & never lasted long in mine. trouble with that alarm is it might be ok for a house ,but if you get up in the night in a apartment for a whizz ,you will prob set it off . 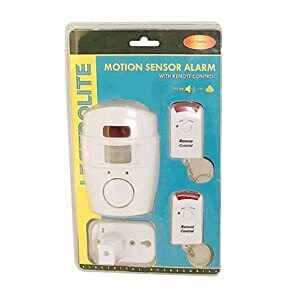 The best one i reckon is what i have & that is the window vibration alarms that actually go off the second someone tries to force a window or a door from the outside . at least with them fitted to each window or door [you can see them stuck on the glass from the outside ] they will go off before they actually get into the property .They are not expensive & they have a on /off switch on each one . Got mine from B&Q. lets face it ,you want to deter them from actually getting in. •	Keep expensive equipment and items away from your windows. •	Install locks or secondary security devices on all accessible windows so they can't be opened far enough for someone to crawl through from the outside. •	Burglars often target the elderly, so be a friend and keep an eye out for local retirees. •	Fire doors are meant to let a person safely exit a building in case of fire — not to let a burglar safely enter it. Keep your hardware updated and the doors closed. 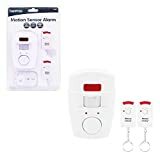 •	When living with multiple people, make sure everyone understands the importance of home security. It only takes one person to leave everyone else vulnerable. But don't rely on others; keep your private possessions locked away. •	If you have had a bad experience already with a crook — learn from it — don't just think bad luck won't strike twice! Last edited by Mushtaq; 20th September 2010 at 08:47..